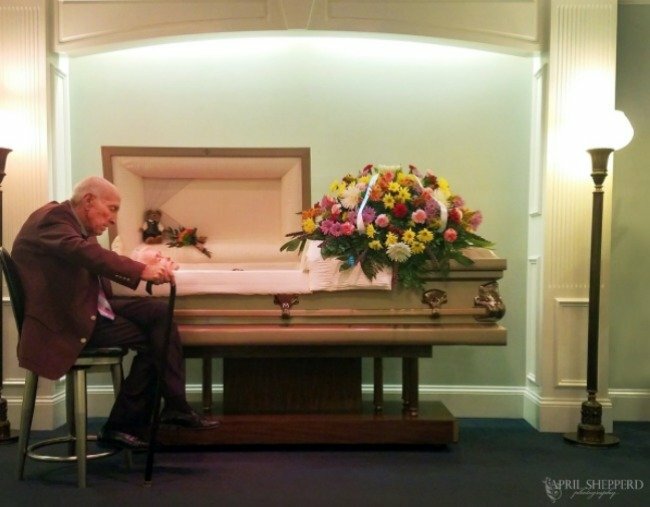 The viral photo of man at wife's coffin bringing people to tears. Why the heartbreaking story behind this photo has been shared tens of thousands of times. When he walked into the room his steps were faulty, but his determination was undaunted. His eyes were fixed upon his destination at the front of the room. A steel grey casket sat under the colored lights. Half of its lid was propped open; the closed half held a spray of vivid, mix-matched flowers adorned with ribbons which read the words “wife” and “mother.” Upon approaching and without pause, he leaned down and kissed her painted lips, his frail body trembling to keep upright. Listen: Robin Bailey and Bec Sparrow reflect on the concept of death, and speak to professionals about what we can learn from those who have passed. Post continues after audio. Never had I seen a man so broken, robbed of his happiness by the curse of death. I wondered as I watched him, what would he do tomorrow and the day after that? Today was the easy part. Today she was still here, lying beside him, able to be touched or seen or kissed. Tomorrow, after she is laid deep in the ground, and he returns to their home, what then? Her things will still be there – the smell of her skin, scribbled grocery lists, her favorite chair, leftovers in the fridge, their bed. Their bed. How does one sleep alone after 59 years of lying next to your best friend? I can’t imagine ever sleeping again. This post originally appeared on April Yurcevic Shepperd’s Facebook page. You can follow April here.